The Curve Leicester revival of White Christmas starring Danny Mac and Dan Burton transfers to the Dominion Theatre this holiday season! West End White Christmas tickets now sale! This holiday season might seem far away but it's never too early to think about the perfect Christmas present. This year White Christmas tickets will definitely have you on everyone's nice list, so don't miss your chance to get into the holiday spirit with this festive staging of a cinema classic. White Christmas musical at London's Dominion Theatre this Christmas 2019! This festive season can see you taking a trip to Vermont with White Christmas tickets. The Made at Curve production of the classic film of the same name will be coming to the Dominion Theatre for the holiday season and will be sure to spread all that Christmas cheer and joy. Danny Mac and Dan Burton are set to reprise their roles from the recent Leicester production. After phenomenal success with Scrooge The Musical last year, Artistic Director Nikolai Foster comes together once again with Oliver-Award winning choreographer Stephen Mear to bring this festive favourite film featuring Irving Berlin's hit music to the West End stage once more. The Irving Berlin-written musical, White Christmas, is considered an X-mas must, and the Paramount Pictures film of the same name, which starred Bing Cosby and Danny Kaye, is nothing short of a classic. The iconic Christmas film tells the story of Veteran duo Bob Wallace and Phil Davis and their successful song and dance act after World War II. With love on the brain, the pair make a journey to Vermont in hot pursuit of beautiful singing sisters who are heading to their Christmas show. When they arrive at the lodge. they’re caught off guard by the lodge's owner, who happens to be Bob and Phil’s former military commander. Danny Mac (Sunset Boulevard) will star as Bob Wallace and play opposite Oliver Award-nominated Dan Burton (Top Hat, Kilworth House) who will star as Phil Davis. Further casting is yet to be announced. This timeless musical features an unforgettable score, including ‘Blue Skies’, ‘Count Your Blessings’, ‘Sisters’, and of course ‘White Christmas’, which remains one of the most famous and well-loved Christmas songs of all time. These are also arguably some of the greatest musical theatre songs ever written, and combined with a heart-warming tale of friendship, hope and the quest for love and happiness, it’s no surprise that White Christmas remains an unforgettable classic. The White Christmas musical features a book by David Ives and Paul Blake, music and lyrics by Irving Berlin, direction by Nikolai Foster, choreography by Stephen Mear, costume design by Diego Pitarch, set design by Michael Taylor, lighting design by Mark Henderson, sound design by Tom Marshall, new musical arrangements by Jason Carr and orchestrations by Larry Blank. You can dream of snow, but you don’t have to dream of White Christmas tickets when the holiday season comes rolling into town. 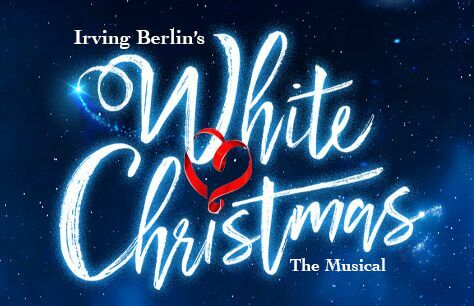 Ensure your Christmas is both merry and bright and book your tickets to Irving Berlin’s beloved White Christmas musical at the Dominion Theatre as soon as they go on sale Monday, 25 March 2019. The production contains loud gunshots and strobe lighting effects during the opening sequence. Haze and low smoke is used throughout the production. A snow effect will be used at the end of the performance both on stage and in the auditorium.